Bayside is a culturally and linguistically diverse (CALD) community comprised of many cultures and people with a history of diverse traditions. The City of Bayside is a community of many cultures and people with a rich history of diverse traditions. Almost half of our residents (46% - 71,894 people) were born overseas and 53% of people speak a language other than English at home. Our City is home to a number of skilled migrants who play a key role in terms of contributing to our local economy. Our multicultural community is one of the many assets that make Bayside a dynamic place to live, work and play. Bayside Council leads and contributes to a number of initiatives that enhance the health and wellbeing of our multicultural communities. For the last 20 years Migrant Information Day has been held annually at Rockdale Town hall. The event is an opportunity for our culturally and linguistically diverse communities to access information from government and non- government organisations and services. The fun and interactive event helps newer residents to settle more smoothly and increases opportunities for engagement with the broader community. Doing It Differently is a grants initiative of up to $10,000 per project being delivered in the Bayside Local Government Area (LGA) by South Eastern Sydney Local Health District and Bayside Council. The grant process is very simple with support offered in developing project ideas. Doing it Differently represents a great opportunity for multicultural groups and organisations supporting cultural diversity to run projects and programs. 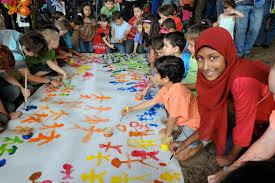 Refugee Week is Australia’s peak annual activity to raise awareness about the issues affecting refugees and celebrate the positive contributions made by refugees to Australian society. While Bayside is home to a relatively small number of people from a refugee background, Council is an active contributor to Refugee Week and held two events in 2018 to engage the broader community and raise awareness. With such diversity within our City, there are always cultural and religious holidays being celebrated and observed by our communities. Multicultural NSW publishes an annual calendar of some of the events and dates.